This demo video demonstrates how to convert AHD to HDMI using the AHD-CV7 video converter. The AHD-CV7 is an AHD to HDMI video converter. This video will explain how it works and show how high definition video from 720p and 1080p AHD CCTV cameras is converted to a HDMI signal for use by a TV monitor. Here's how it works, the AHD security camera is connected to the BNC video input of the AHD-CV7 using coax cable such as RG59. In many cases installers want to send the video from the camera to both the surveillance DVR and a monitor, for this reason an AHD video loop output exists via a BNC connector that could be connected to the input of a DVR, use of this loop output is optional. The HDMI video output of the converter is connected to a monitor using a standard HDMI cable. One example use for this is in retail locations, many retail stores like to display a public monitor of the store entrance so that customers are aware of the video surveillance system in use. By using a 720p or 1080p AHD camera, retailers can now display this definition in high definition. When the converter is powered on it will detect the resolution of the camera input, and the monitor output resolution, and the video feed will appear. Now I am switching to a full screen view of the HDMI video output to perform some video tests. Initially I do not have a camera connected, which is why the screen displays those colored lines. When I plug a 720p resolution AHD camera into the BNC input the converter detects and displays the resolution of the camera in the upper left. Below that the resolution of the HDMI monitor is displayed. Next I disconnect the 720p camera, which causes the screen to go black for a few seconds. Then I connect the 1080p resolution AHD camera. The converter detects the 1080p resolution of the camera, and again displays live video on the HDMI monitor. For current pricing on the AHD-CV7 and to learn more please visit www.cctvcamerapros.com/CV7 thank you for watching. Click here to learn more about the AHD-CV7 AHD to HDMI Video Converter used in this video. 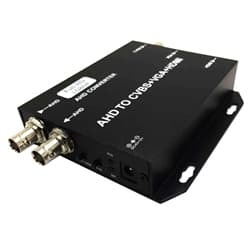 The AHD-CV7 works with all AHD CCTV cameras on this page as well as any 720p or 1080p HD-TVI camera.